ORLANDO, Fla. - June 12, 2018 - PRLog -- Florida Community Association Journal magazine announced its fifth annual Readers' Choice Award winners in the March 2018 issue of the magazine with an expanded section profiling notable winners for the year. 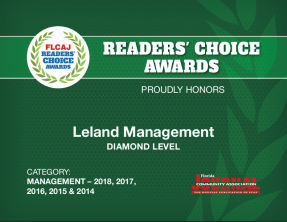 Leland Management is honored to have received the Diamond Level Award for the 5th consecutive year. The FLCAJ Readers' Choice Awards is a unique recognition program that shines a spotlight on the positive and productive contributions by community association service providers across Florida.They are presented to service providers that demonstrate through their commitment to the community associations they serve an exemplary level of proficiency, reliability, fairness, and integrity. Leland Management is a community association management firm serving over 400 associations throughout Florida. Although Leland has all the resources of a large Association Management firm, Leland is family owned and provides the focus and personal customer service that a family owned business can offer. Leland has been serving Florida community associations for 20 years. For more information on Leland Management please visit them online at http://www.LelandManagement.com or email them directly at info@lelandmanagement.com. Isn't it time for a change?